“A doctoral program offers training to and through research and professional research experience. It leads to the production of new knowledge. It requires the doctoral candidate to complete a personal research project. It is enhanced with complementary courses approved by the doctoral school. It focuses on a topic of scientific, economic, social, technological, or cultural interest. It is confirmed by the awarding of the French PhD diploma. The diploma, delivered by an accredited public institution of higher education, grants its holder the rank and title of doctor. The PhD diploma can be earned as part of initial education or lifelong education. The specific skills acquired during this program allow recipients to practice a professional activity at the end of their doctoral program in any area, in either the public or private sector. In 2015, the PhD diploma was transferred to the PSL level by the founding members. 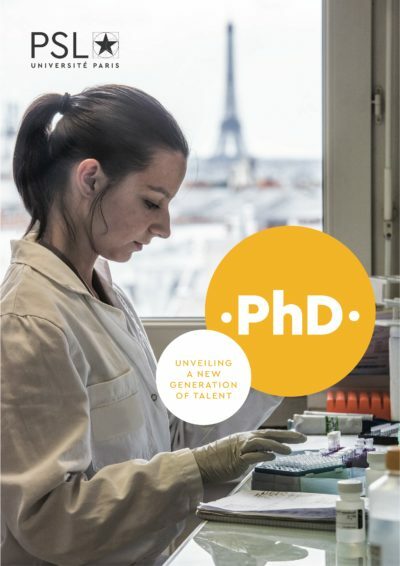 Starting with the 2015/2016 academic year, all doctoral candidates are enrolled at PSL and diplomas are conferred as “The degree of doctor at PSL (Paris Sciences & Lettres), prepared at [name of the dissertation preparation institution]” in one of the doctoral specialties approved by the doctoral school councils. View the list of doctoral specialties by dissertation preparation institution or by doctoral school.